If Cats and Dogs Could Vote, Which Party Would They Vote For? The other day I was playing with my dog and I said something about moving ‘to the left.’ Naturally, my wife recalled the Beyoncé song, “To The Left.” However, since I spend a lot of time watching and thinking about politics, my first thought was that our dog was moving “to the left” — politically. That then made me think, if cats and dogs could vote, who would they vote for? Now, we can quickly descend into a discussion about animals’ ability to think, but that’s not where I’d like to go with this. Let’s assume that animals would be “rational actors” and vote in their best interest (regardless of how they may or may not be swayed from charismatic politicians or issue ads). Keeping in mind that this is all meant in jest, let’s begin! If dogs could vote, who do you think they’d vote for? If I had to choose, I think they’d probably vote for the Democrats (or a Liberal party). Why? Well, let’s look at a dog’s life — they’re really interested in ‘programs’ (take me or a walk, feed me, etc.) where the government (owner) takes care of them. Of the two main political ideologies, who do we think is more likely to offer this? Okay, now let’s look at cats. 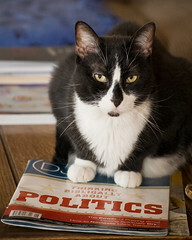 If cats could vote, who do you think they’d vote for? If I had to choose, I think they’d probably vote for the Republicans (or a Conservative party). Why? Well, look at a cat’s life — they really say (well, they don’t speak, do they?) and do whatever they want, whenever they want. They’re not interested in coming when you call them and they pretty much take care of themselves. To me, this *sort of* gets to the whole idea of ‘personal responsibility that you hear from politicians/parties on the right. This experiment was meant in jest, but it’s a great way to exercise your thinking muscles. Can you think other pets and which parties they might prefer? Let us know in the comments! This entry was posted in Politics and tagged Cat, Conservative, Democrats, Dog, Liberal, Personal Responsibility, Pets, Republicans, Social Programs, Vote, Voting. Bookmark the permalink. An interesting post-script to this: it’d interesting to see the results of a survey of Democrats/Republicans to see: a) if they have a pet (cat/dog) and b) which kind of pet would they prefer (cat/dog). I don’t have a hypothesis, but I think it’d be fun to look at the results.